A New Lily? A look at TV babies of the past. Television has been pulling this since the beginning of time. 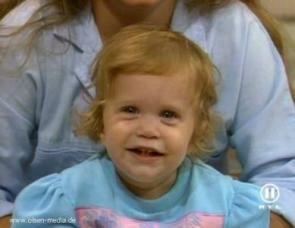 Babies are cast, and then it’s realized that babies don’t do much so they’re swapped with older doppelgangers. Recently it was announced that Modern Family was going to replace the baby that plays Lily – Cameron and Mitchell’s adorable adopted baby from Taiwan – with four-year-old Aubrey Anderson-Emmons. I was quite sad to hear this as I felt that part of Lily’s charm was the fact that she was a silent accomplice to Cameron and Mitchell’s hilarious agenda to be the coolest gay Dads around. Baby Lily - We will miss you! But baby Lily’s departure from the show made me think about other kids who have come onto the scene only to be replaced by more interesting older versions of themselves. Let’s start with Boy Meets World. When the show started, Corey and Eric had a charming little sister named Morgan. Morgan was Eric’s ticket to the ladies. She was adorable and hilarious but yet her time came to an end so soon. Morgan Matthews - wingman extraordinaire. Anyway, in the middle of the second season of Boy Meets world Morgan disappears without any explanation. Then miraculously in the fourth season she returns as a much older version of herself. Cory greets her saying “Long time no see!” to which pre-teen Morgan responds “That was the longest time out I’ve ever had!” Well played, Morgan. Well played. Next we must take a look at the tortured world of soap operas. It is well understood that nothing that happens in soaps makes any sense. People get possessed, lost in fields where they meet their blind soulmates, and people frequently don’t die – but other people think they did. But the most puzzling mystery of all is the insanely speedy growth of children into adults. Let’s take Nicholas Newman of Young and the Restless fame. Wikipedia has December 31st, 1988 listed as his birthday, but in 1994 Nicholas was replaced by the then teenage super-stud Joshua Morrow (Editors note: Joshua Morrow is still a super-stud). Regardless, Nick Newman SHOULD have been seven years old in 1994 but instead he was 16. Today Nick should be 33 but instead he is 38. Who the hell is in charge of math at Y&R anyway?! Interestingly enough while Nick Newman has been aging at an insanely rapid and (albeit confusing) pace and impregnating the likes of Sharon Collins – the rest of the show was moving like molasses running uphill on a cold day. I guarantee if you turn on the Young and the Restless today you will be caught up on the plot line with 4 minutes. The only child that seems to have been able to hold down a long-term spot in the limelight was Full Houses’ Michelle Tanner. Doesn't matter if you don't think this baby is cute. This baby is a money maker. The Olsen Twins were not the cutest babies in the world – but somehow Miller-Boyette Productions knew they were ugly ducklings and let them flourish. I’m not sure how you go about starting a production company at the age of 7 – but if I could turn back time I would likely follow in their footsteps and do the same.